Expand your horizons with the Camp Tioga adventure program. 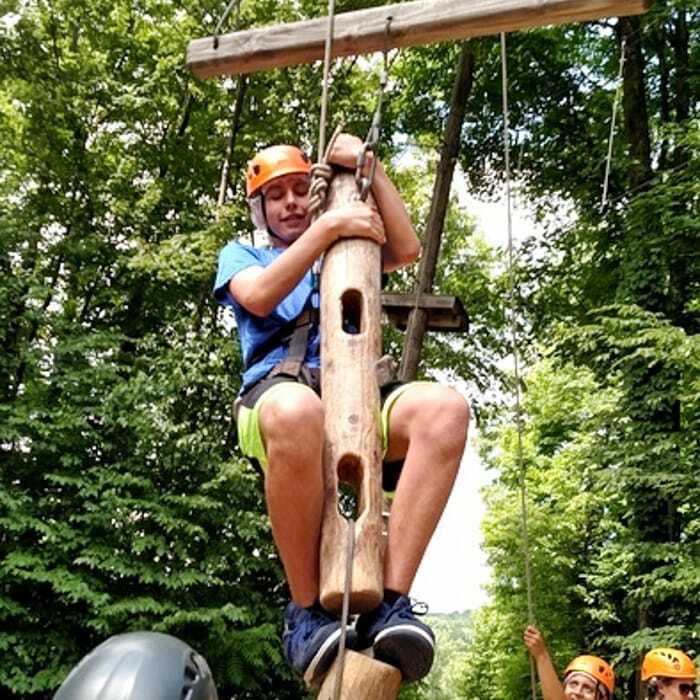 Our zipline is one of the longest in Pennsylvania and compliments our extensive High Ropes course which of course includes a Giant Swing. Closer to the ground we have our low ropes course, built with obstacles that require teamwork and communication to navigate. If you’re looking to climb, take a spin on our climbing tower with multiple levels of difficulty based on experience. Beyond our ropes courses, take a hike up Elk Mountain, or to a waterfall. Go mountain biking through our trails! Our property of over 110 acres is ready to be explored. When it’s all said and done, they’ll be ‘smores waiting for you, this is camp after all! 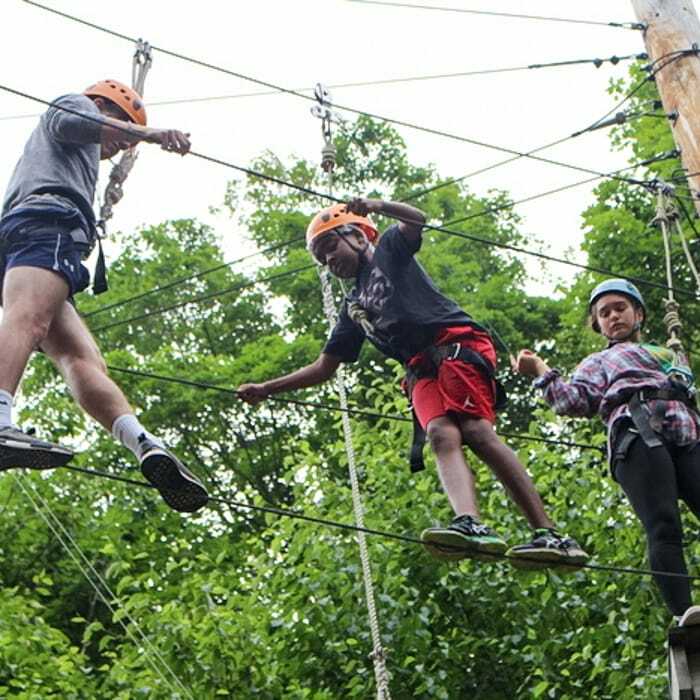 The Camp Tioga High Ropes Course is designed to challenge and excite campers of all skill levels. Our Giant Swing asks campers to dig deep as they take a leap of faith and reach for the sky! If you’d rather go for a ride, try our zip line. Designed to pass over roughly half of our campus, enjoy sailing through the sky, the wind in your face, as you enjoy the beautiful scenery around you. Our team challenge course is designed for ultimate communication, trust, and action. Our Low Ropes Course is a team first environment. Different team activities involving balancing and swinging put our campers in a position to trust and depend on each other. Campers walk away stronger and closer as a group. 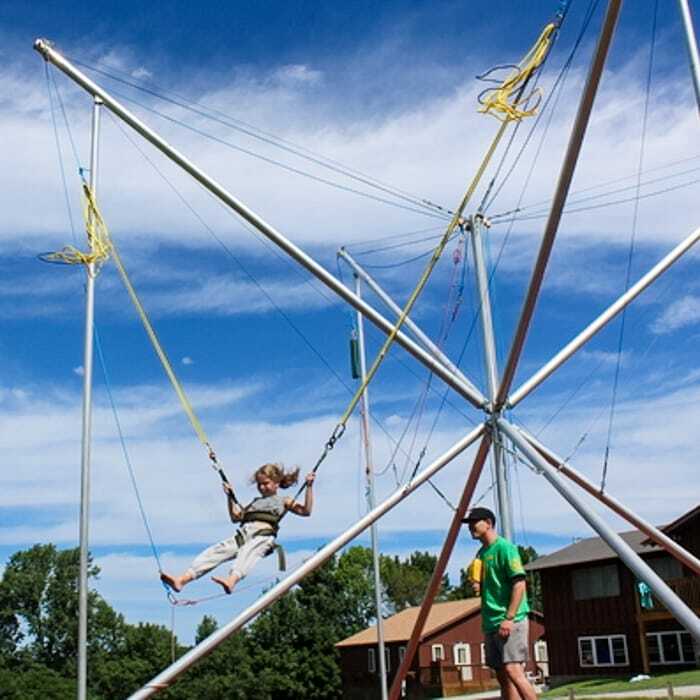 The Camp Tioga climbing tower has various levels of difficulty ranging from beginner to expert. 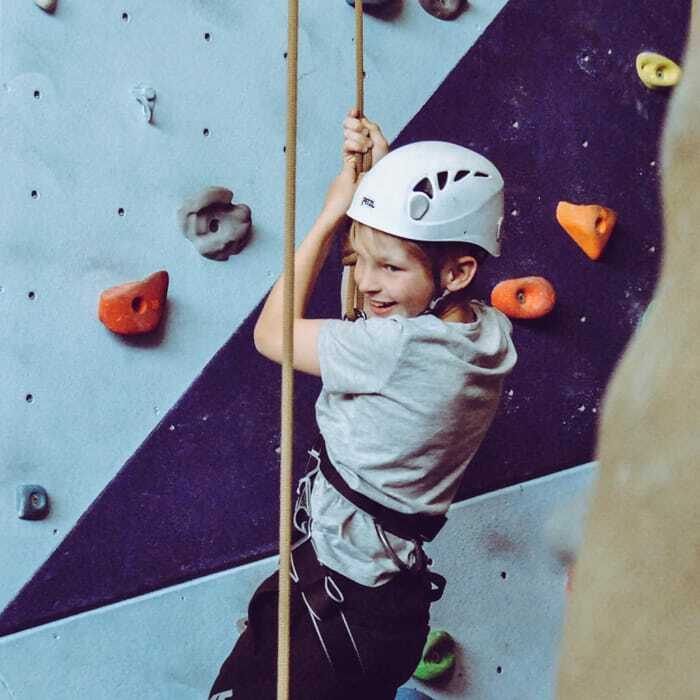 If you’ve never tried climbing before, try our low to the ground climbing wall that allows you to take a spin at climbing horizontally before taking a turn climbing high in the air. Our four person bungee trampoline allows up to four campers at a time to jump hire into the air and perform different tricks. Spinning, flipping, and twirling are all staples at our bungee trampoline, an exciting activity for all age groups. 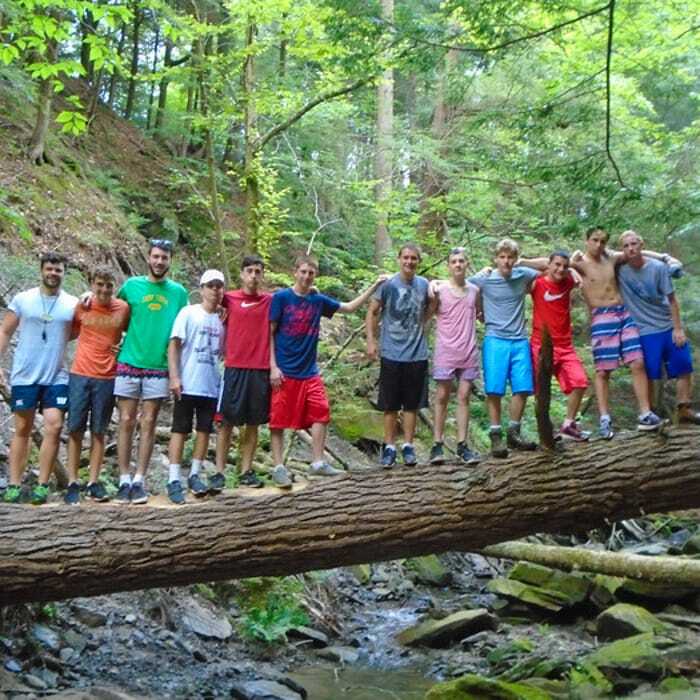 Camp Tioga is located on some of the best hiking trails in the Northeast. Our Gold trail is guided down a picturesque stream and is an easy hike for a single activity period. The Green trail is a more advanced trail that ends with a fantastic waterfall that will take your breath away. Come pick sides. 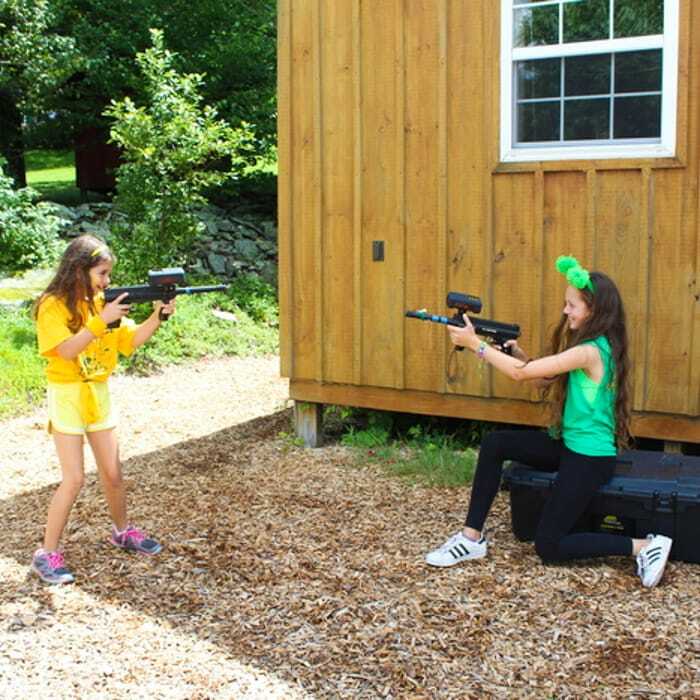 Our laser tag course built into the edge of the Camp Tioga forrest provides a perfect backdrops for games, including capture the flag. Our athletics programs are second to none in the camping world! There’s no place on camp with views like our waterfront – plus, two Olympic-size pools! Let your creative juices flow with a combination of performances, crafts and lessons! From the Tioga Circus to Puppy Playing, you won’t find activities quite like these at any other camp! Join us for classic campfires, exciting color war, epic Tradition Night and much more! Our oldest campers split their summer between Camp and a once in a lifetime travel experience.